Honinbo Sansa (Japanese: 本因坊算砂, or Nikkai (Japanese: 日海), 1559-1623) was the first head of the Honinbo house, first Meijin Godokoro and a Meijin Shogidokoro?. 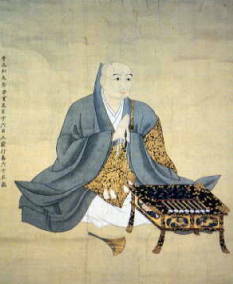 Honinbo Sansa was a Buddhist priest of the Nichiren sect and his dharma name was Nikkai. He lived in a temple pavilion called Honinbo, where he taught go and shogi. After becoming Meijin, he took the name of Sansa. For many years it was believed that Honinbo Sansa had a rivalry with a person named Kashio Rigen. However, evidence referred by Fairbairn & Hall (2009, p. 198-9) suggests that in all probability the name Kashio Rigen was a confusion based upon another text, where the two names Kashio and Rigen are immediately next to each other. This would mean that Kashio and Rigen are different people and Honinbo Sansa had a rivaly with two individuals, rather than a single person. In a Hikaru no Go chapter, Kimihiro Tsutsui acts as Nikkai in a play. Bozulich, R. (1999). Go Seigen, the 20th century's greatest player. Yomiuri Shimbun. Retrieved May 30, 2005 from http://gostart.ru/e017.html. Fairbairn, J. & Hall, T. M. (2009). The Go companion: Go in history and culture. Richmond, VA: Slate & Shell. Nihon Kiin. (1995). Kido Yearbook 1995. Tokyo, Japan: Nihon Kiin Publishing.